We had so much fun for Robby's birthday. I feel like we have been celebrating it all month, but I guess you only turn 7 once. 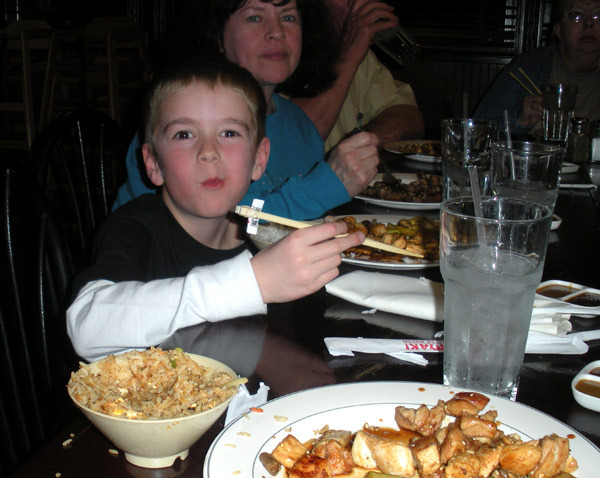 On Robby's birthday, we went with Kirk's parents and Emily to Tempenyaki, one of those Japanese BBQ places that cooks your food at the table with lots of fire and knife tricks. Robby loves that place and has been begging to go for a long time, so we thought his birthday was a perfect time. He had a blast and was really proud of himself since he ate his whole meal with chopsticks. Zoe thought it was pretty fun too. She loved the food and all the noise and confusion. She freaked out a little with the fire though. She liked to view it from a distance, but when it was at our table, with the heat and the noise, it was a little too much. A couple of days later, my parents came, and we celebrated his birthday again. I made him this great little Wii cake. My cake decorating skills could use a little work, but he loved it, so that is all that matters. 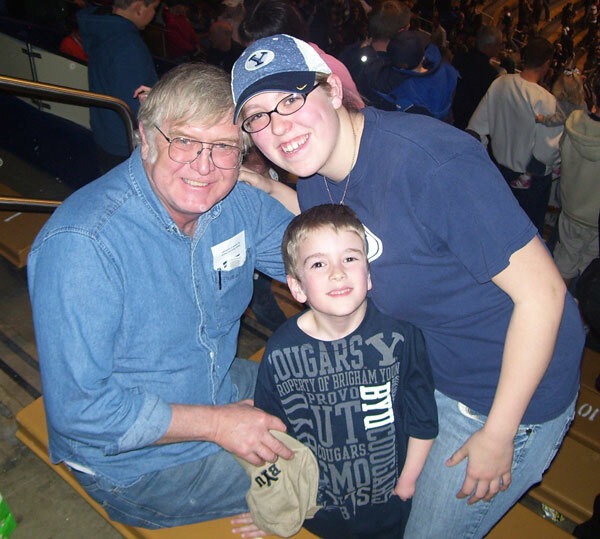 Grandpa, Emily, Robby, Zoe, and I, then went to a BYU basketball game. We had a blast. 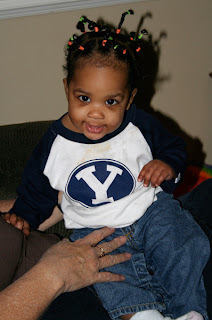 I just had to throw in this picture of Zoe all decked out in her BYU duds. The next week Robby had a birthday party with his friends. Robby's best friend, Kalvin, is 6 days younger for him, so usually they just have a joint party. This year, they decided to have a Star Wars party. 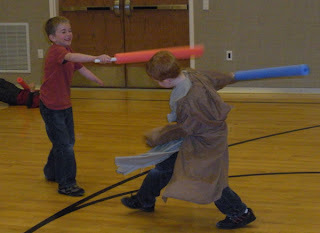 We made light sabers out of pool noodles and they had a big light saber war in the church gym. They thought it was the greatest thing ever. It was a big success. Here we have the great Jedi's Robby and Kalvin showing off their mad light saber skills. All in all, I think he had a great birthday. Even though we maybe went a little overboard, I love celebrating his special day. The day he was born was one of the greatest days of my life. Being a mom is the best thing that ever happened to me and truly is something to celebrate. I am so lucky to be the mom of such an amazing boy. 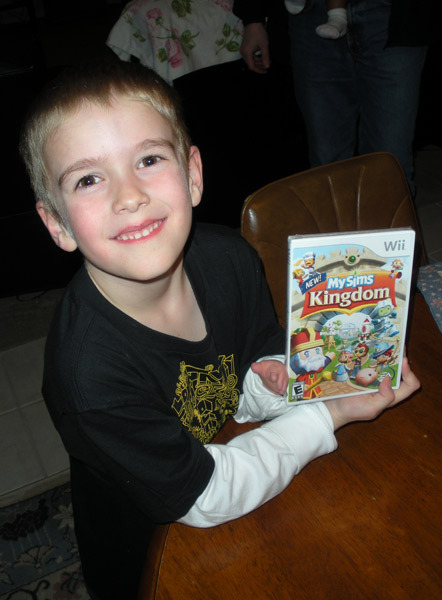 He is such an good kid, so smart, creative, independent, obedient, and loving. 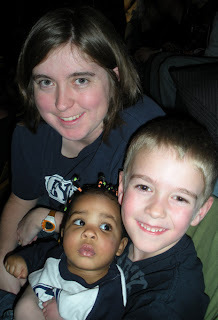 The last seven years have been crazy but I am incredibly thankful for every single day. It makes me a little sad to see my baby growing up so fast, but I can't wait to watch him learn and grow even more and to see what the future holds. 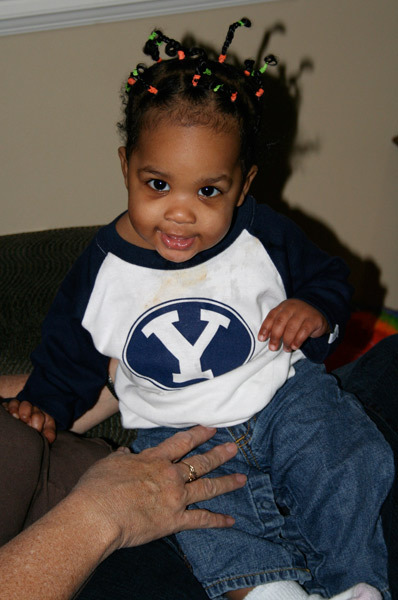 I love Zoe in her BYU attire! 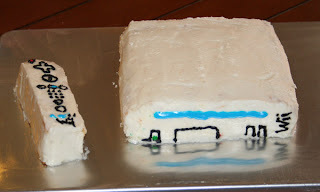 And that cake...you are so clever!